Last year when Divergent was released, I was a heavy skeptic. The premise of a post-apocalyptic Chicago that separates its citizens into personality types and shuns those who don’t conform, just didn’t seem that interesting to me. But the movie, based on a young adult book series, ended up being a pleasant surprise. Tonally like The Giver with a dash of Hunger Games action, I left the theater feeling optimistic about the series even if the first movie had meager production value and a head scratcher ending. 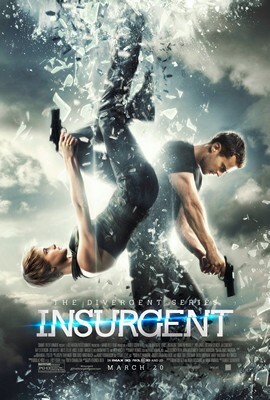 This year’s follow up, Insurgent, picks up with its lead heroes Tris Prior (Shailene Woodley) and Four (Theo James) on the run from Jeanine Matthews (Kate Winslet). Jeanine is hunting Divergents (those who fit into every societal category and are therefore dangerous to the system) so that she can unlock a secret box leftover by the society’s founders. Meanwhile, Four’s long lost mother (Naomi Watts) is looking to form an army between the broken factions (the Selfess and the Brave) and the factionless in hopes of seizing power from Jeanine. If you think that summary was convoluted, you might want to avoid this movie or see it multiple times to actually grasp everything. The film is incomprehensible without having seen the previous installment, and even if you have, things may be murky if you haven’t watched it recently. Much like in the previous movie, little is done to make sure you understand what the five factions are and why they’re significant. But being complicated isn’t this movie’s prime issue. The constant plot holes and wandering narrative are. I mentioned plot holes in my review of Divergent last year, but I let them slide. Maybe I shouldn’t have, because it’s as if Director Robert Schwentke (RIPD, Red) decided it was ok to never explain anything. With nearly every scene, something happens that doesn’t make any sense or something takes place that seems like it will fall into place later but is never given clarity. Then there are several characters, some old and some new, who barely get screen time despite having the potential to be very influential to the plot. Overall, the film isn’t nearly interesting enough to overcome the sloppy holes in the narrative. The promos tease Matrix-style sequences and loads of action, but none of the stakes seem nearly as high as the film makes them appear; For instance, Tris must pass simulated tests designed for each faction or she’ll die, but four of the five tests can be passed with simple common sense and the only one that isn’t is completed first. I’ve never read any of the books in Veronica Roth’s Divergent series. I want to now. Not because I’m intrigued by these stories, but because I need to see if they make more sense on paper. It’s really good to see Liam Neeson branching out and trying some really different roles. Seeing him break his usual mold is always refreshing. Alright… obviously I’m joking. But, kudos to Mr. Neeson for at least understanding what makes the old, grizzly action hero so fun to watch. This time, Neeson’s retired man with “a particular set of skills” is Jimmy Conlan. A former hitman for his old friend/boss Shawn Maguire (Ed Helms), Conlon is now a washed up drunk who is no longer welcome in the home of his son, Michael (Joel Kinnaman) because of his past dirty deeds. That is, until his son is witness to a murder committed by Maguire’s spoiled, reckless son, Danny (Boyd Holbrook). Killing Danny to save his own son’s life, Jimmy Conlan must shake off the rust for one night to keep his son alive as he is hunted by Maguire, a hired hitman (Common), and the police led by a detective with a grudge (Vincent D’Onofrio). 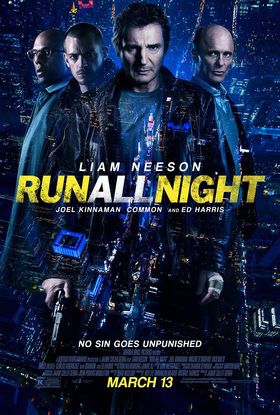 A movie called Run All Night should deliver what it promises in the title. And although it takes far too long to get into things, once the running starts, it barely slows down. Neeson’s action films have an expectation to live up to (Taken, The Grey, Non Stop) and they also have a low point (Taken 2 & 3). Here, the connection between all of the major players is established well enough to make you care and the action isn’t too over the top to make it as unbelievable as it was in last year’s Taken installment. That isn’t to say that the movie doesn’t have its fair share of cartoony flaws; the biggest coming from Common’s role as Mr. Price. The character is perhaps the sloppiest “trained assassin” ever, killing cops with one shot yet failing to kill Neeson multiple times from point black range when his back is turned. He could’ve been left out of the film completely. Not to mention Common’s acting ability hasn’t improved. Be prepared to take some mental liberties with Run All Night. The inconsistent cinematography might also get bothersome. But for what it’s worth, the movie has some intensely exhilarating moments that hearken back to films like Harrison Ford’s The Fugitive. Is it a classic? No. Is it even memorable? Probably not. But other than the first Taken, do any of Liam Neeson’s action movies fit those criteria? And yet… we can’t help but be intrigued each time. So I guess we’ve reached that point where Disney is beginning to run out of ideas, because now their just doing live-action versions of their classic animated films. Last summer, I had the slight displeasure of watching Angelina Jolie make an all too-sweet re-imagining of Sleeping Beauty. In 2017 we’ll be given a remake of Beauty & The Beast. But, for now, we’ll focus on Disney’s latest rehash: a retelling of perhaps the most retold story of all time, Cinderella. There’s no point in going over the plot of this movie. If you don’t know Cinderella, you’re probably not old enough to read. This adaptation takes direct influence from the 1950’s animated version. Cinderella is fairly played by Lily James, Cate Blanchett is the wicked Stepmother, Richard Madden is Prince Charming (or ‘Kit’ as he is called in this movie) and Helena Bonham Carter is the Fairy Godmother. The mice from the animated version are also back although they don’t talk. At times this movie will feel like a long in the tooth version of a story we already know. There are several moments that are flat out “role your eyes” cheesy; moments that only the starry eyed little girls in the audience will enjoy. But what Director Kenneth Branagh (Thor, Jack Ryan: Shadow Recruit) does wonderfully is give perhaps the most thorough version of the fairy tale ever. For the first time, characters are given depth. 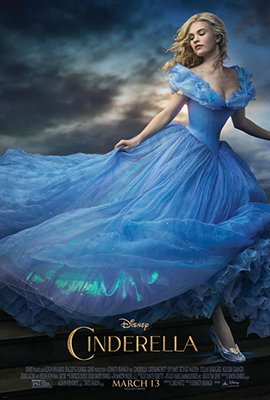 Lady Tremaine is more than just a cold-hearted wench who makes Cinderella’s life a living hell just out of spite. She is a beautiful, heartbroken woman unfortunately driven by jealousy and shame for her two dimwitted daughters (Sophie McShera and Holliday Grainger). Cate Blanchett’s layered performance is perhaps the emotional core of the story. This film also manages to fill in all of the tiny details to make the tale more cohesive. We no longer have to leave the theater wondering how no one in the kingdom shares Cinderella’s shoe size. The movie also doesn’t skim on the sheer scope and grandeur. The effects are nice, but the costumes and sets are absolutely breathtaking. Last summer’s Maleficent felt like an unnecessary re-imagining and it didn’t quite flow. So it is probably a good thing that this Cinderella sticks close to the well known tale. Yes, it’s just Cinderella. And sometimes that makes it boring. But at least it is a well acted, well written version of a story we’ve heard over and over again. It’s often difficult to use the word ‘overrated’, because it habitually carries a negative connotation. Simply put, just because someone dubs something ‘overrated’, it doesn’t necessarily mean they didn’t enjoy it. It could just mean that it might not be as memorable to them as the masses proclaim it to be. And in my opinion, based on his previous works (District 9, Elysium), director Neill Blomkamp is overrated. Blomkamp’s newest South African sci-fi production revolves around 2016 Johannesburg where crime has hit Gotham-city level chaotic. To answer this problem, the police force contracts a weapons manufacturing company to create humanoid robots that will act as policeman (Stop me if you’ve heard this premise before). However, the robots’ chief engineer, Deon Wilson (Dev Patel), has greater aspirations. He wishes to create the first thinking/feeling robot mind much to the disapproval of his boss (Sigourney Weaver in a role as useless for her as the one she played in last winter’s Exodus). After secretly stealing a faulty police drone to test his newly created Artificial Inteligence., Wilson is kidnapped by a trio of down on their luck gangsters (headed by South African hip hop duo Die Antwoord) who wish to use the robot for a massive heist. But before the gangsters can train robot Chappie (voiced by Sharlto Copley) to do their bidding, they must first raise his infant-like mind up. Meanwhile, Wilson’s rival (Hugh Jackman) seeks to get rid of all police drones in favor of his human controlled MOOSE attack robot. Like Blomkamp’s previous works, the movie has a similar realistic feel to it thanks to practical special effects and imagery. But once again, in my opinion, Blomkamp seems to fall short on narrative and storytelling. Sure, Chappie’s journey is a heartfelt one, but it can’t quite shake off an all too familiar set up. Having a more fleshed out villain would help. But both Jackman’s Vince Moore and Brandon Auret’s brooding gangster, nicknamed “Hippo”, are nothing more than angry, greedy cliché foils. If you come purely for action, you probably won’t be disappointed. The film features several entertaining sequences fit with the necessary explosions to fill Blomkamp’s usual quota. But if you’re looking for humor or an enriching, thought provoking plot that you’ll remember after more than a few days then look elsewhere. Personally, I didn’t find District 9 to be as awe-inspiring as others. And Elysium was entertaining, but nothing special. 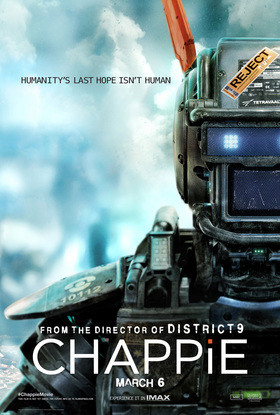 Chappie isn’t as original as District 9 but is as action packed as Elysium so it fits comfortably in between and shouldn’t be considered any more of a disappointment than anything else in Blomkamp’s inventory. Apparently, it’s very important not to lose focus when you’re a con artist. It’s also probably a good idea not to lose focus when making a movie about con artists. Unfortunately, Focus, written and directed by Glenn Ficarra and John Requa is actually a movie that fails to do what its title suggests… which is disappointing, because there are plenty of resources at their fingertips, such as a fine cast and a soothing soundtrack, to make something fantastic. When things are clicking in Focus, the movie is pretty riveting. You’ll have to suspend a pretty heavy portion of your common sense to believe some of the jobs pulled, but the same can be said for any heist film. But, as mentioned above, the movie seems to veer off in its second half. Instead of tense scenes involving high stakes gambling that take place in the first hour, the movie chooses to focus more on the sexual tension between its two leads. Will Smith stars as Nicky Spurgeon a.k.a “Mellow”, a veteran con man who leads an entire legion of expert con artists during Super Bowl weekend in New Orleans. After an attempt to con him fails, rookie Jess Barrett (Margot Robbie) gets taken in under Nicky’s wing where she eventually falls for him. Together they have solid chemistry which is important for a movie that promotes itself like a high stakes heist film, but is actually more of a romantic drama. Sure, there’s still a con involved, but it’s buried so deep by a quasi-love story that it kind of feels like you’re watching a completely different movie from what it began as. The romantic aspect of the film isn’t bad, but it sure isn’t as interesting as the moments where we are trying to guess whether or not Will Smith is pulling a con. Thus, instead of an exciting thriller with a strong romantic subplot, we’re left with a decent, but forgettable movie about a girl that wants to trust a guy, but a guy who can’t stop lying. 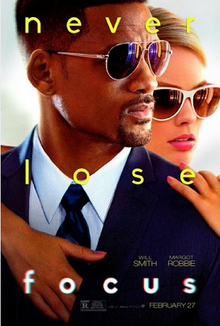 Maybe, convincing us that this would be a movie about con-artists was the real con. THE DUFF Every generation deserves at least one good teen movie. Now those “loveable” millennials have theirs in this film about a young girl (Mae Whitman) who discovers that she is the Designated Ugly/Fat Friend to her two attractive and popular high school buddies. With the help of her Jock next door neighbor (Robbie Amell), she sets out to shake her label and fend off her cyber-bully nemesis (Bella Thorne) in time to woo her class crush (Nick Eversman). 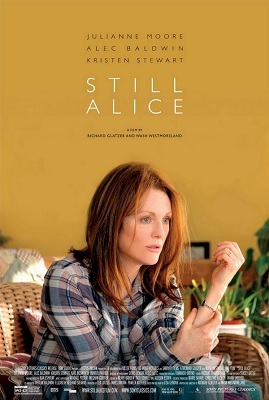 STILL ALICE Julianne Moore stars as a Linguistics professor and mother of three (Kate Bosworth, Hunter Parrish, and Kristen Stewart) going through early-onset Alzheimer’s. Alec Baldwin co-stars as her fellow collegiate professor husband trying to keep her from losing herself as she battles this devastating, memory effecting illness. From the start, it is easy to see why Moore won the Oscar for Best Actress as she gives an emotionally powerful performance that guides what could’ve been a bland narrative. 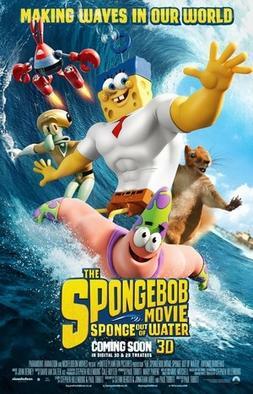 SPONGEBOB: SPONGE OUT OF WATER Nickelodeon’s longest running cartoon character returns to the big screen for his newest dizzying adventure. This time everyone’s favorite whimsical sponge must team up with his arch-rival to bring back the missing recipe for Bikini Bottom’s most coveted fast food sandwich before the town falls deeper into chaos. Spongebob’s mission takes him on a journey through time and even above water to challenge Antonio Banderas as the new villain, Burger Beard.